As you sift through design magazines to find the perfect combination of color and style for your bathroom, there's no reason why you can't take two great ideas and make them work in your space. According to Better Homes and Gardens, combining chic wainscoting and a delightful pattern of wallpaper can create a welcoming setting at any time of the day. The wallpapered area of your bathroom should be a focal point of the space, so put it behind a bathroom vanity. Be sure that your wallpaper has a predominant hue that can be used throughout the space, so you can use it on the walls above your wainscoting. Around your bathtub or shower area, wainscoting combined with a paint color of your choice can help to unify the arrangement. Be sure to incorporate matching towel racks, faucets and other bathroom accessories that can match the other piece of hardware in the space to have a fabulous mixture of multi-faceted color and patterns. You may not get it right the first time, so be sure to sift through the many color and wallpaper possibilities to find the right combination. 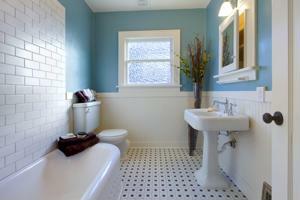 What paint color and wallpaper pattern work well in your washroom?